Cats don’t care what dogs think,they just look down and sort a wink.perch themselves way up high,the dog barks and starts to cry.it’s really not fair,those agile cats,hiding in places,just like rats.the dog wants to play,join in the fun,chase that cat,make it run.but cats careless,don’t need to play fair,like to tease,don’t have a care. Poor dog sits and wonders why?sly old cat naps with a sigh.dogs keep guard,waiting for a twitch,cat doesn’t move,not even for an itch.the game goes on,cat unaware,the dog just pleads,please care…YOUR dog is part retriever,that’s what the breeder told me. I am not sure she realized,which dog she really sold me.he will not ever fetch a Frisbee, ball or stick.and it would be a stretch to call catching winks a trick.is the breeder a deceiver?is my dog a low achiever?she told me part retriever. I am not sure I believe her…If I Were A Giant..if I were a giant I wonder if I could stand on my tiptoes and paint the sky. I’d fashion paintbrushes from branches of trees,and paint all the clouds as they float on the breeze. 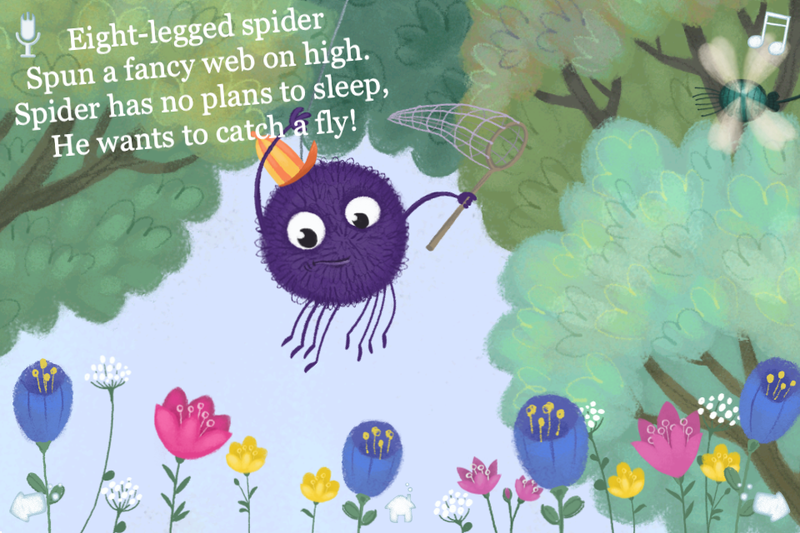 I’d wake up quite early when morning was new and paint all the daisies with pollen and dew. I’d blend all the colours from desert to dray,and mix up a sunrise to splash on the sky. I’s stride to the mountains and gather the snow to paint snow-white blossoms where blossoms should grow. I’d dip my tree brush in the yellow corn…and I’d paint golden beaches by waving my hand. I’d grind autumn leaves,some pink ones,some red,and cover the sun as she set off to bed. I’d hunt all the shadows that hide from light and dip them in pen ink and blacken the night. i can dream i am a giant from the books on my shelf,but I know when I wake nature’s painted herself. There was a young lady of Niger,who smiled as she rode on a tiger;they returned from the ride,with the lady inside,and the smile on the face of tiger. There once was an old man from peru,his poor llamas came down with the flu,in the valley he passed,all the people who gasped,at the beast that was uttering moo. There once was a jumping monkey and jumping he would always be,he fell off a cliff,because he was stiff,now jumping he will never be. There was an old man with a bread,who said,’it is just as i feared!two owls and hen,four larks and a wren,have all built their nests in my bread! 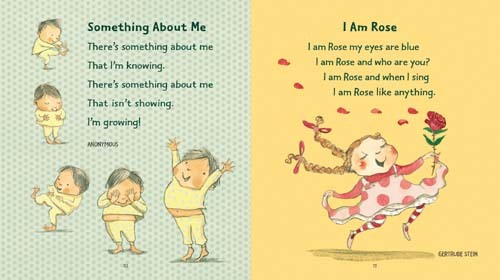 There’s something about me,that i’m knowing.there’s something about me,that isn’t showing.i’m growing! Walk alongside me,daddy,and hold my little hand,i have so many things to learn,that i don’t yet understand,teach me things to keep me safe from dangers every day.show me how to do my best,at home,at school,at play.every child needs a gentle hand,to guide them as they grow.so walk alongside me daddy,we have a long way to go. Our kittens have the softest fur,and the sweetest little purr,and such little velvet paws,with such cunning little claws,and blue eyes,just like the sky!must they turn green by and by?two are striped like tigers,three are as black as black can be,and they run so fast and play with their talls,and are so gay,is it not a pity that each most grow into a cat..
Eight-legged spider,spun a fancy web on high.spider has no plans to sleep,he wants to catch a fly! 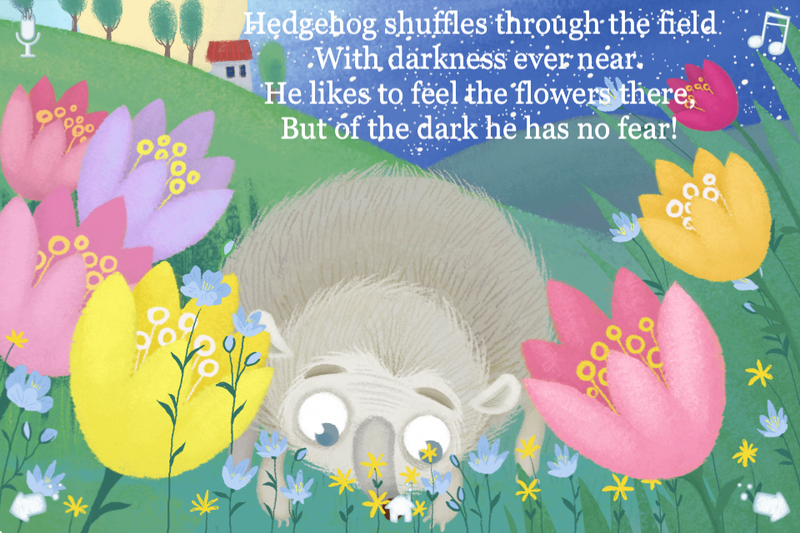 Hedgehog shuffles through the field with darkness ever near.he likes to feel the flowers there,but of the dark he has no fear! Twinkle twinkle little star,how i wonder what you are,up above the world so high,like a diamond in the sky,when the blazing sun is gone,when the nothing shines upon,the you show your little light,twinkle twinkle all the night. 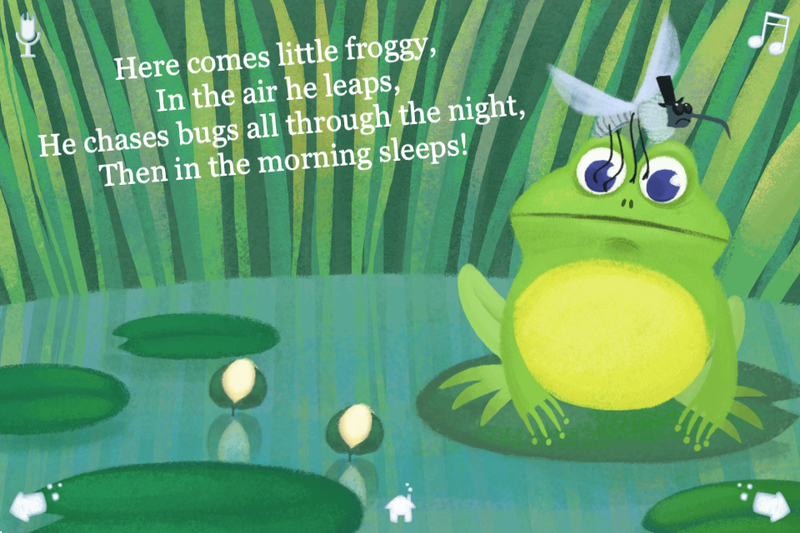 Here comes little froggy,in the air he leaps,he chases bugs all through the night,then in the morning sleeps! 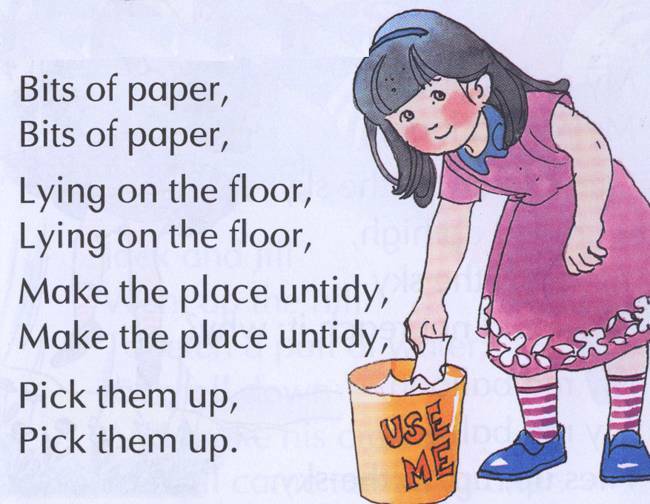 Bits of paper,bits of paper,lying on floor,lying on the floor,make the place untidy,make the place untidy,pick them up,pick them up. 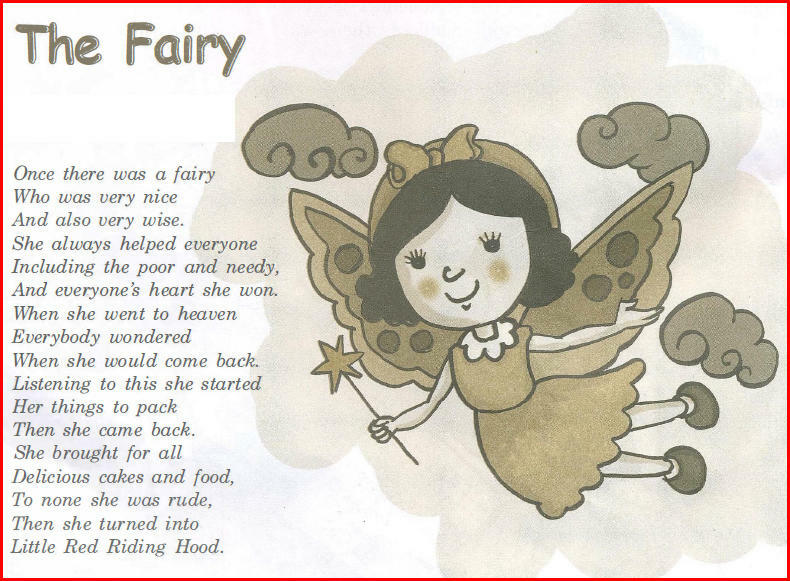 Once there was a fairy,who was very nice,and also very wise.she always helped everyone,including the poor and needy,and everyone’s heart she won.when she went to heaven,every wondered,when she would come back.listening to this she started,her things to pack,then she came back,she brought for all.delicious cakes and food,to none she was rude,then she turned into little red riding hood. 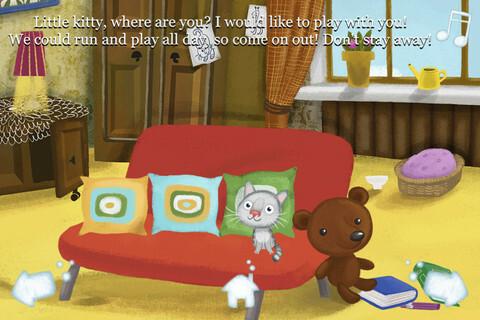 Little kitty,where are you?i would like to play with you!we could run and play all day so come on out!don’t stay away! 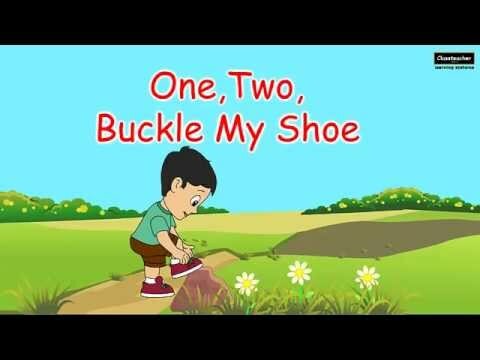 Jack and Jill went up the hill,to fetch a pail of water. 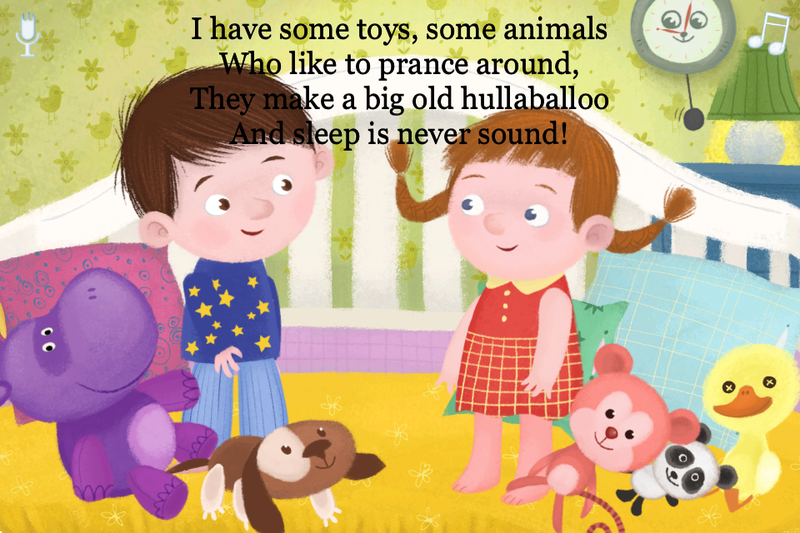 I have some toys,some animals,who like to prance around,they make a big old hullaballoo,and sleep is never sound. Silly owl don’t sleep all day,you’re missing all the fun.silly girl don’t sleep all night,the mice are on the run.silly owl why wait til night,just to catch a mouse,i have plenty,more than twenty,right there in my house. A little bird,with a little bill,sat upon my window sill,what happened next,i could not say,for he soon did flay away.a little bird with a little bill,came again to my window sill,i lured him in with a piece of bread,and now he is sleeping in my bed. 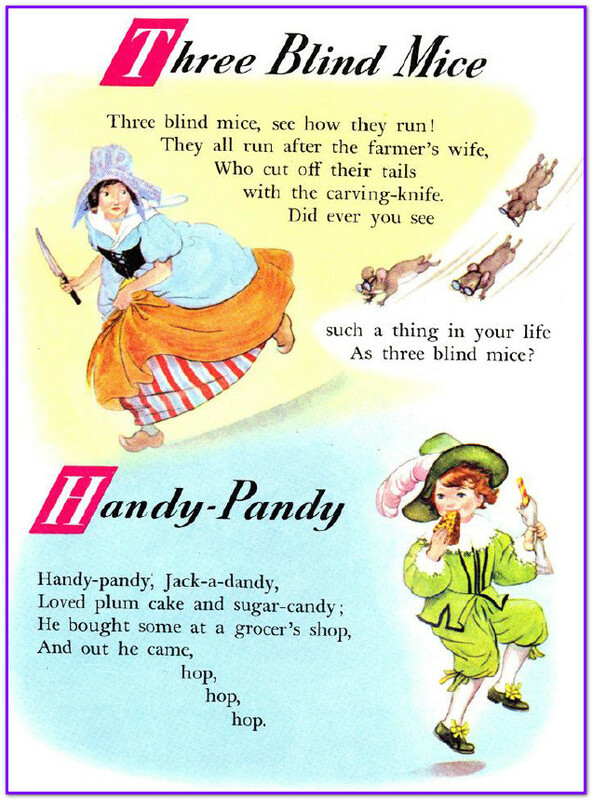 Three blind mice,see how they run!they all run after the farmer’s wife,who cut off their tails with the carving-knife.did ever you see such a thing in your life,as three blind mice? There was a crooked man,and he went a crooked mile,he found a crooked sixpence,against a crooked stile;he bought a crooked cat,which caught a crooked mouse,and they all lived together,in a little crooked house. 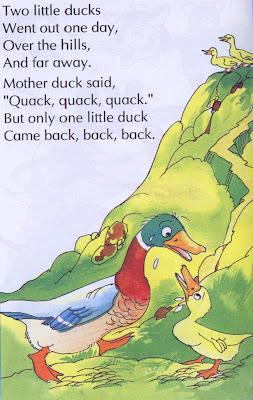 Two little ducks,went out one day,over the hills,and far away.mother duck said,”quack,quack,quack.”but only one little duck,came back,back,back. 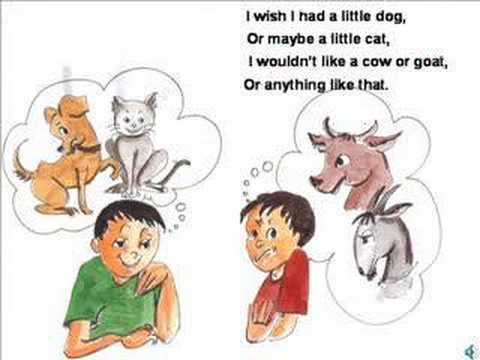 I wish i had a little dog,or maybe a little cat,i wouldn’t like a cow or goat,or anything like that. For your neighbors,lend a hand,show them that you understand,they have right we must protect,show them kindness and respect,foe your neighbor try to care,when they’re troubled help repair,lend an ear and listen too,if they’re worried,help them through,for your neighbors give a smile,spend time with them for a while,look after your neighbor’s needs,and Allah will reward your deeds. I hear slurping,i smell chicken,i see yellow broth,i feel slippery noodles,i taste salty vigitables,what could it be?it’s chicken noodle soup! May your stuffing be tasty,may your turkey plump,may your potatoes and gravy,have nary a lump,may your yams be delicious,and your pies take the prize,and may your,thanks giving dinner,stay off your thighs! 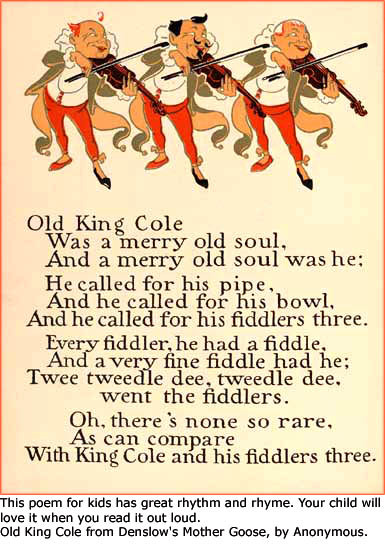 Old king cole,was a merry old soul,and a merry old soul was he;he called for his pipe,and called for his bowl,and he called for his fiddlers three.every fiddler,he had a fiddle,and a very fine fiddle had he;twee tweedle dee,tweedle dee,went the fiddlers.oh,there is none to rare,as can compare,with king cole and his fiddlers three. Creative,shy,inventive and intelligent,brother of a silly sister,lover of animals,friends and the beach,who feels happy,sad and funny,who needs animals,family and friends.who fear nightmare,deep water and scary movies,who would like to see the rainforest,a luna moth and tropical butterflies. On the floor lies tiny teddy,half a paw is gone already.he is tattered,torn,and lame.yet i love him just the same. Look we both know i did it…but who would convict a face like this?